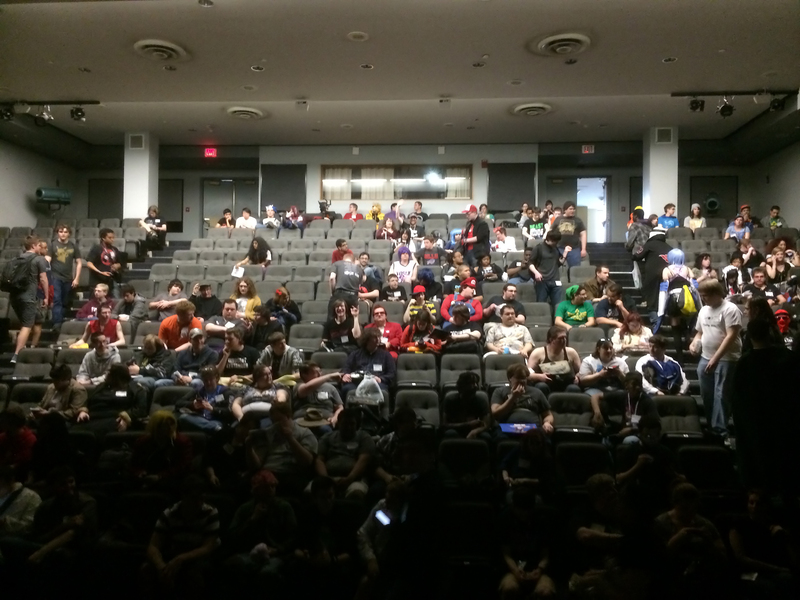 Con Report: UBCon B Great! My first American con of the season and it started off in the town of Buffalo, New York. The place, the University of Buffalo. Inside its student union complex students, alumni and fans from the western side of New York state congregate to enjoy the world of tabletop gaming and anime culminating in climactic Nerf battles on the stroke of midnight. The building is overrun with the sound of warfare in foam form. 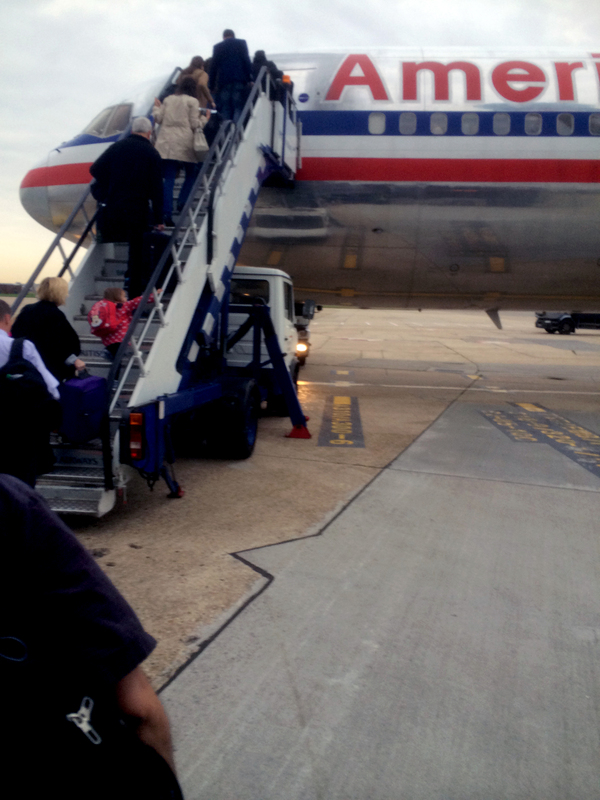 American Airlines was my carrier. Safe from mishap. Prior to this confrontation, my friends had had their own battles to face in the form of United Airlines. 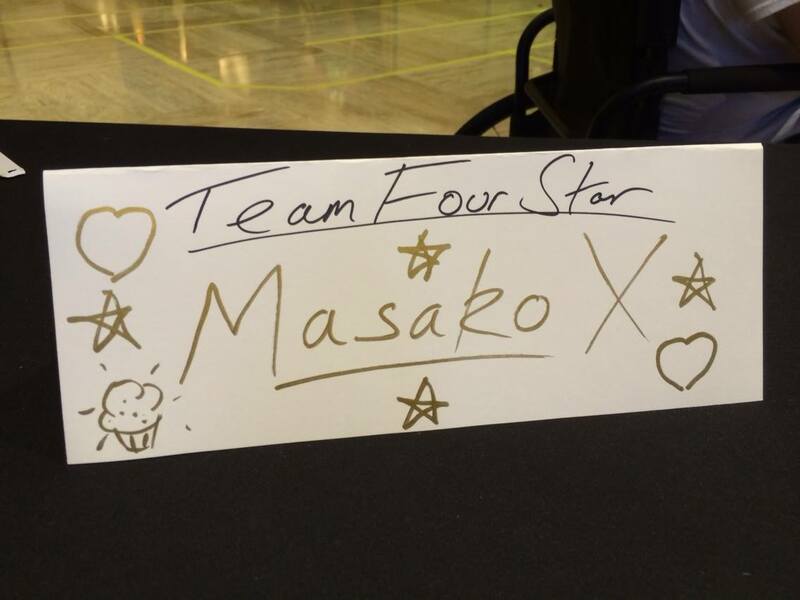 Due to their administrative fumblings, Lanipator [one of the TeamFourStar posse] was unable to attend and it was down to myself and KaiserNeko to entertain the college contingent. Once I got off my American Eagle flight to Buffalo Airport, I met up with the con’s chairman John and immediately felt a youthful and motivated drive at the helm of this convention. Kaiser and I then met up at our hotel with some of our friends and fellow abridgers. Shaz, Revy and Kaiga came to hang out with us for most of the convention and helped get us to the con. That’s not to say the convention weren’t helpful; far from it. John and his staff made sure that we were looked after and that our panels went smoothly. On the Friday I got to know the con layout with Kaiser and met up with some of our fans who were keen to see us and asked how we were finding Buffalo. It was nice to hear from fans on the east coast of the US and find out that everyone was here to have a fun time as well as being really chummy. We then bumped into Eric Vale [famous voice actor] who was guesting at the convention as well and were immediately made to feel welcome in his presence which was pretty awesome! His handler [also named Eric] was also a great guy and the pair of them were brilliant company throughout the weekend. 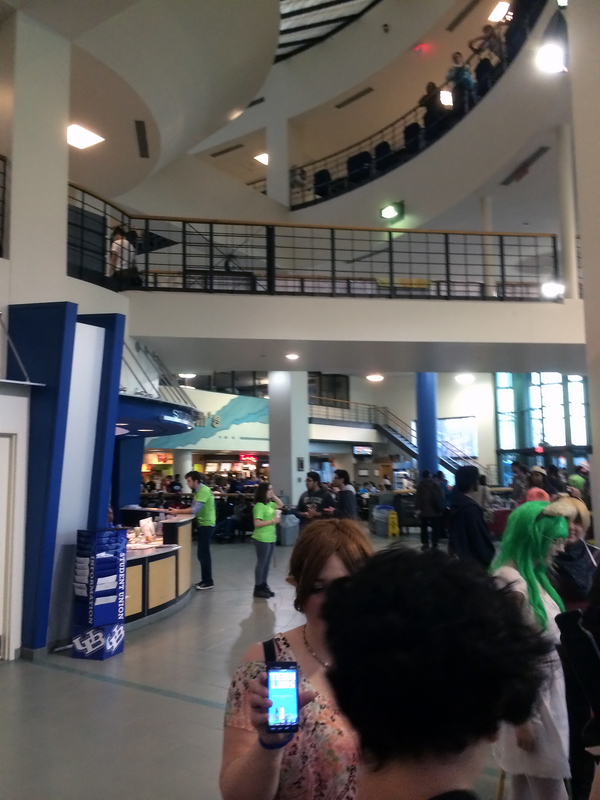 The con space is primarily based in the Student Union part of UB’s North Campus with the main foyer being the location of most of the gaming, the maid cafe, admin and the artist alley. I was unable to find the Dealer’s Room sadly as I would’ve liked to see what it had on offer, but this wasn’t meant to be because of a lack of signage pointing us to the venue. If your main aim was to buy stuff, that would’ve been a bit of a hindrance; luckily the con staff are happy to help as I did get lost a few times and they pointed me in the right direction. The mix of attendees range from the young to the older generations who have been going to the convention for years, even decades [the con started in 1989!] and it was splendid to see such a big age range present. People of all ages were socialising and playing games; it was great seeing more experienced gamers sharing their skills with the new generation of players. That’s what I liked most of all about UBCon – it felt like a family. 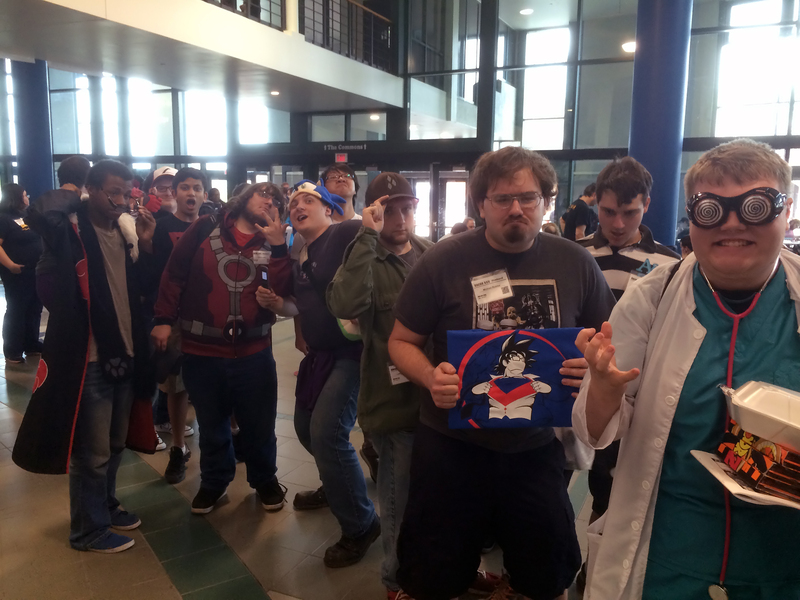 Most university-based conventions feel that way and this con leads the way in that feeling having been around for so long and the staff all having a common interest in all things geeky. 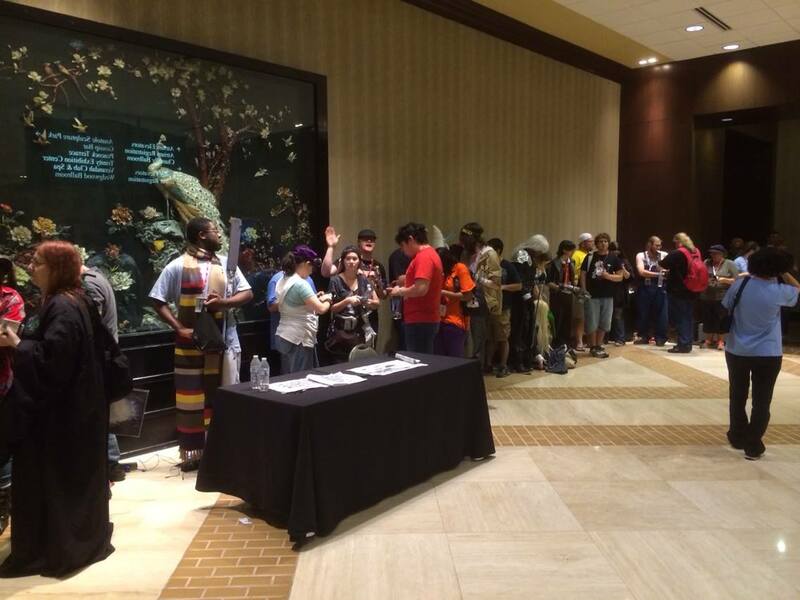 Part of the line for the TFS autograph session. The main day for Kaiser and I was Saturday where we had an autograph session [which ended up being reprised later that day due to sheer demand!] as well as four hours worth of panels back-to-back. The first being the regular TeamFourStar Q&A panel and the second the 18+ version. Both panels went superbly with the dynamic feeling a lot different to panels I have been on with the rest of TeamFourStar; with Kaiser and I on stage working the audience, it felt a lot more grounded and serious whilst also being just as fun and entertaining. 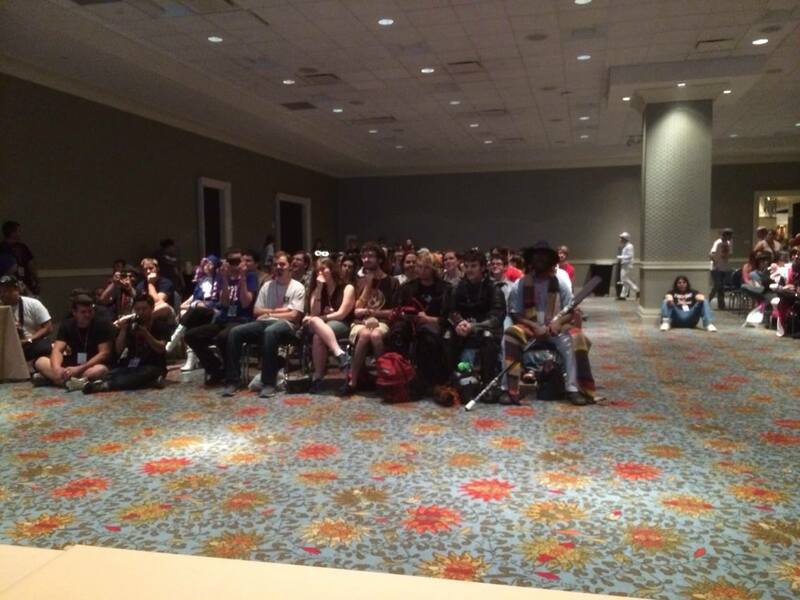 It was a great audience which stayed mostly the same for both panels. A standout question was one fan asking us what our favourite curse word was…that’s what you get at 18+ panels [I’ll save my favourite for when we meet in person!]. One thing’s for sure, we were pretty tired! During these panels, John [dressed as Phoenix Wright] and his assistant Mickael were on hand to make sure we were kept hydrated; that act alone meant a lot as it was clear to see that the con had our interests at heart. After that, we stuck around for Eric Vale’s After Dark panel and it was a fantastic panel which felt really involving and engaging despite it ending at around two fifteen in the morning! The late night panel with Eric Vale was punctured briefly by the sound of the Nerf War going on outside. We had experienced some of it trying to get Eric’s panel with dozens of participants scrambling around us dodging fire with whatever they could find whilst Kaiser, John and I had to cover ourselves and walk briskly to the theatre door. It was a shame we were so tired from our panels that we couldn’t take part but it looked fun! 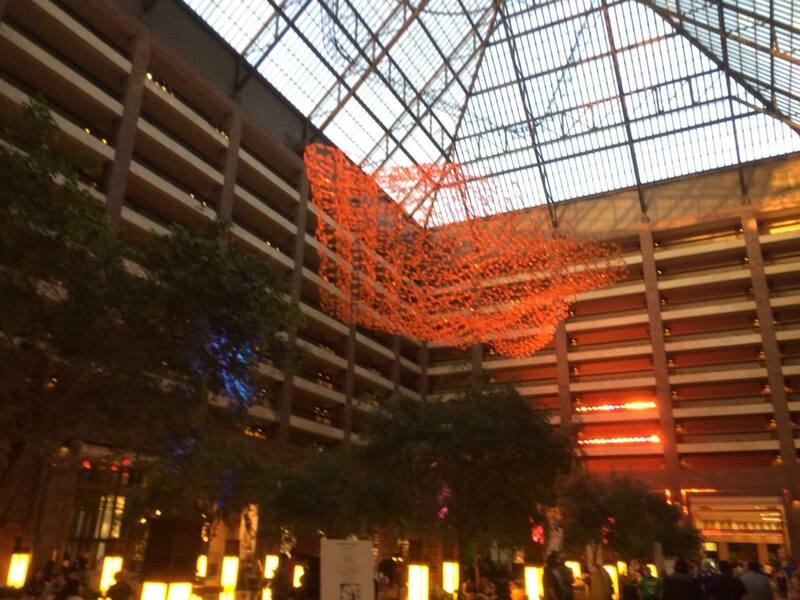 This was the convention’s signature event and it seemed to live up to its expectations! 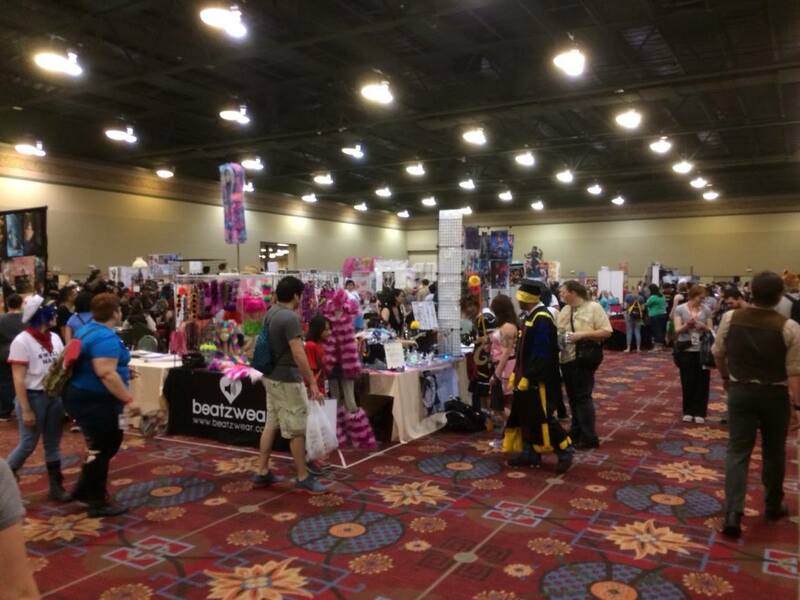 Sunday was relatively quiet with most of the congoers winding their ways home and us with little to do other than the con banquet for the guests and the staff to celebrate the end of the convention. It was here where I got the biggest feeling of family. Sixty-odd people each giving a speech [myself and Kaiser included] about what the con means to them. With each person that spoke, it tugged at my heart. To witness such love and camaraderie was special. It rounded the con off really well in my eyes. In the end, UBCon was a success despite Lanipator’s absence. 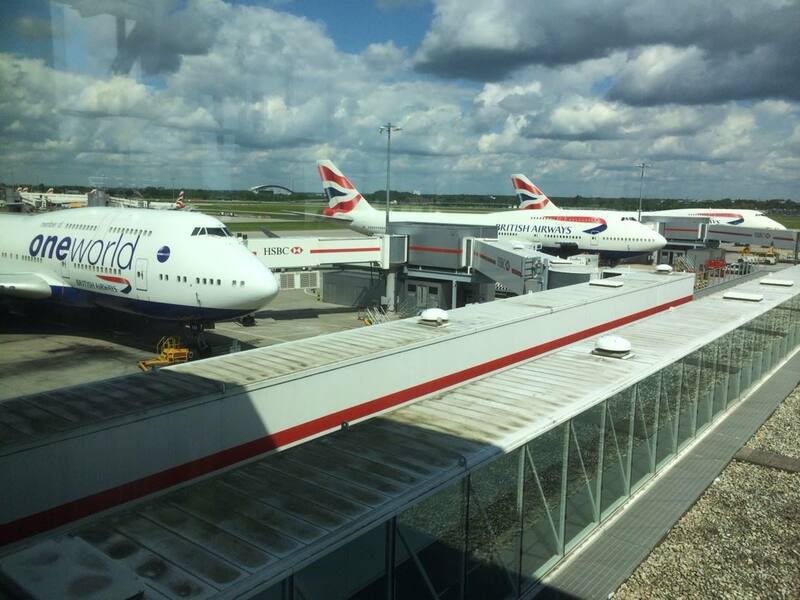 The con were able to deal with the situation professionally and did the best they could given the circumstances. 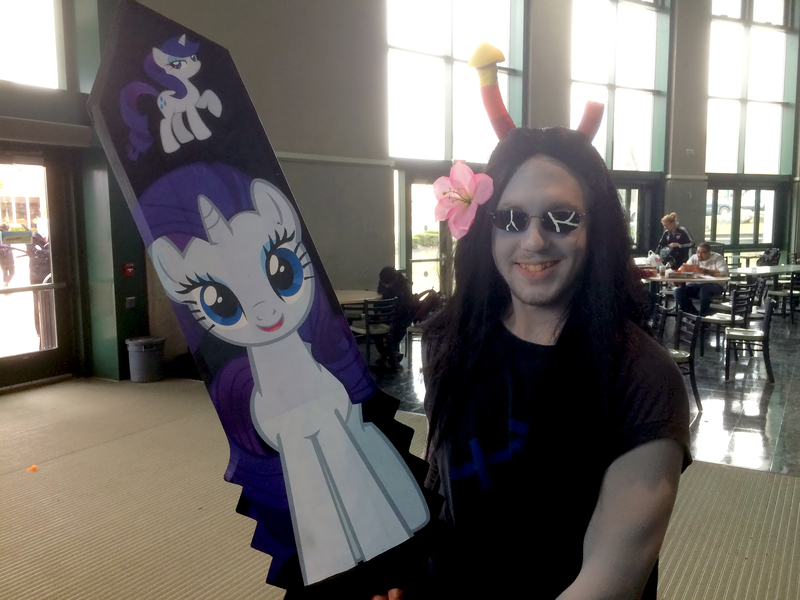 The feelings throughout the event were that it was a local con with a big influence. What con could proudly say that they cause a huge upsurge in the demand of Nerf guns? None, that’s what! My thanks to John, Eric, Jenn, Shaz, Kaiga, Revy, Mickael and Tim for their hospitality and company throughout the weekend. If you’re looking for a con where you want to have a good time and indulge your Nerf fixations, get on over to Buffalo University! One more thing. 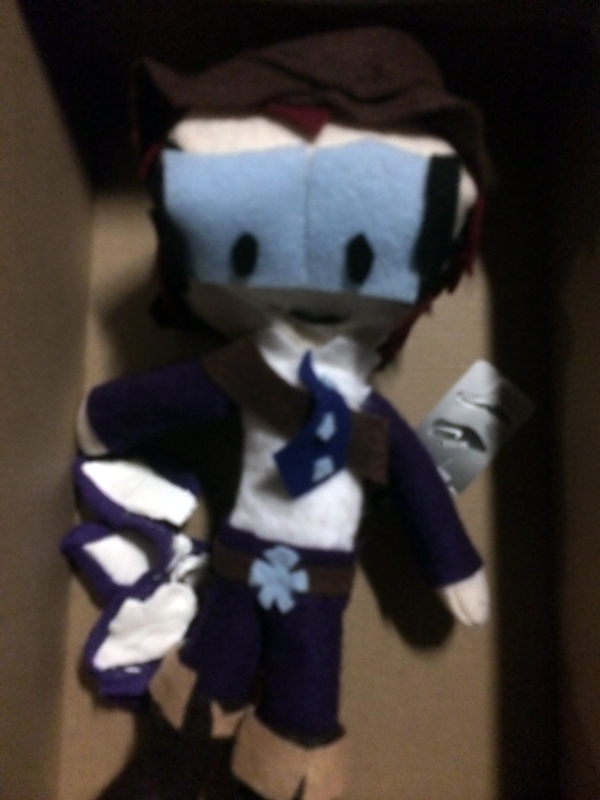 A big thanks to Taylor Stevenson for her adorable Asterob [the character I voice in Kirbopher’s TOME series] plushie which I got to keep. It sits proudly next to my Goku figures on my desk. EDITORIAL: Sub or Dub? What’s the Hubbub? Subbed or dubbed anime? One of the most contentious debates ever to have graced the non-Japanese speaking anime community. Do you go for the localised interpretation or the organic version with context intact yet it means you have to concentrate a little more potentially. This has been a notable quandary for decades, ever since VHS tapes began to proliferate the bedrooms of young men and women in the 1980s with its third-hand recordings which were jittery and sketchy which for the most part had subtitles that were hard-to-read; but these sufficed considering that dubs were mostly restricted to the big budget titles or anime movies. In 2014, we have no such issues. We have access to HD quality content over the internet whenever we want, no need to gather round a small television set and its flickering glow. So is the discussion dead thanks to the advent of new technology? Or has it adapted into something hopefully less contentious? Just so we’re not beating about the bush, I personally don’t have a preference. I will embrace anime in whichever medium it chooses to introduce itself to me. For the longest time, it’s been with subtitles as dubbed anime has been challenging to find on UK shelves. This has meant that I had to import my DVDs at great expense [When I bought a boxset of the series Chobits, it cost me MORE in shipping than the actual boxset!] and thusly it meant my exposure to dubs was limited. Subtitled anime seemed like a good alternative as I had been watching foreign language films in school and college and it seemed natural to gravitate towards subtitled anime. I watched Urusei Yatsura [one of my top 10 anime] hard-subbed [subtitles which are not able to be removed] onto a VHS tape and loved it. As far as I knew back then, there was no dub available [except a poor BBC dub starring Matt Lucas for a special Japan season of programming which was awful.] and I accepted subtitles as the only way to get bijou anime. AnimEigo, which was the most prevalent subtitler of anime in the eighties and early nineties, helped pioneer the emergence of anime in America in particular [Other companies like Harmony Gold also helped this endeavour] with its distinctive yellow and black subtitles etched into our retinas for years to come. Thanks to these companies, anime was able to be imported without the higher costs of hiring a voice cast, record them and mix their audio into the original master mix as well as the time it took to produce that. It was a quick and dirty way of getting anime distributed and it worked. It was a clear boost for anime in America. 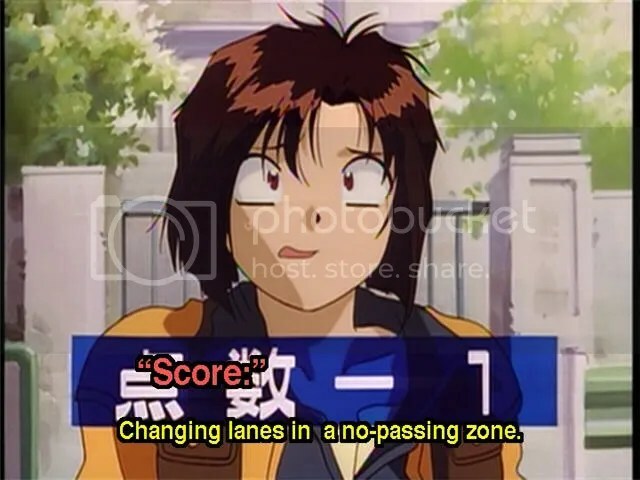 The typical AnimEigo style of subtitles. As the internet became capable of larger downloads, fansubbed anime [anime which was subtitled by amateur/self-professional individuals or groups] began to sprout up and subtitle anime before it was even on American anime licensors had even registered them on their radars. Usually two days after it was broadcast in Japan. To the average fan, this was great; no having to wait months or in most cases years for an anime to be licensed and distributed the conventional way. However, this is of course, morally dodgy. The act of downloading fansubbed anime satisfied the craving us anime fans had had since the eighties but it wasn’t the most legal way of ‘scratching that itch’ so to speak. It could be considered as a contributor to why companies such as Geneon and ADV went under, with the latter re-emerging under two guises [Sentai Filmworks and Section 23] althought there were ultimately numerous factors which led to their respective ends. This fervour for subtitled anime is engrained in our psyche. That simpler time, that seemingly purer time where jokes from Japan were maintained and cultural references were kept as they were and not localised into something that wasn’t true to the original. The typical fan might not get most of the references but they had the peace of mind that what they watching was the real deal and what the folks back in Japan were watching. Be that as it may, there are fans who don’t like subtitles. This could be down to many factors such as the disinclination to read whilst watching movies or shows, the desire to not be confused by ambiguous terminology, the wanting for their native tongue to be heard instead of the unusual Japanese dialect [which I find quite pleasant to the ear I might add] and perhaps most of all they’d rather support an official release of their favourite anime. Fans of subtitles denounce dubbed series as impure or untrue to the source material; something that will not ‘pollute’ their ears. I will agree that dubs in the early days were questionable and did lead to some laughable examples [search YouTube for Bible Black dub and you’ll be amused!] but over time, companies such as Funimation and Viz have refined their practices to produce dubs which are as close as possible to the source material whilst also doing a good effort of making it accessible to those who aren’t as versed in Japanese culture. Modern dubs are far more palatable and in some cases superior to the original [I can think of the dubs of Cowboy Bebop and The Melancholy of Haruhi Suzumiya being two prime examples of this notion.]. There are those that argue that subtitled anime is far quicker when it comes to distribution. That has been true up until recently. DVDs containing dubs of anime have taken months to become available and mostly only on DVD. However, with the release of Space Dandy, Funimation piloted a simulcast [or almost simulcast] dub of the anime with it being pre-recorded and released around the same time as the Japanese dub and made available on their website. This is a turning point in the sub vs dub discussion. Subtitles have had the edge in terms of production speed [Crunchyroll being the main instigator in the art of simulcasting subtitled series and therefore legitimising the online sub market.] but now dubs are beginning to cotton on to the idea of simulcasting dubs. Might this be a sign of things to come with dubs and subs being jointly released? Only time will tell. In my opinion, subtitled anime has had the edge in the anime community due to its easier accessibility and greater perceived authenticity. Nowadays, that argument has been diluted a touch with dubbed anime becoming more rapidly available, at least in the United States. International audiences have to make do with subtitled anime as their first port of call from subscription-based services such as Crunchyroll or Daisuki. The playing field has been levelled out and now both subbed and dubbed anime have a more equal platform in which to win favour with the average anime fan. In the end, the question of which medium is better has been scaled back from a killer debate which can make or break friendships to simply a case of personal preference. Both entities are equally good and each have a lot of effort put into them. Which do I prefer? I don’t mind. I like subtitles because I am used to them and I like dubs because I like to hear another interpretation of a character as to whose animation has been based on another performer; I like that little challenge which is bestowed upon a dub actor. That and lots of my friends are no working in the dubbing community; it’s awesome to hear them in these productions. So what do you think? Do you think the sub vs dub debate has been lessened in importance amongst the animeverse or is still as hot as ever? Leave a comment or better yet, participate in the Anifile poll on the matter. Cast your vote for which medium you prefer.